We braved the middle school girls yesterday and saw The Fault In Our Stars, which if you don’t know is an adaptation of the novel by John Green, who if you don’t know is the brother of my friend Hank, who if you don’t know is awesome. The movie was awesome too (as are the novel and John and probably the middle school girls when you get to know them). There was love and there was cancer and death and Big Questions and a blind kid egging a fancy car. Hollywood didn’t take all the smart out of it. I cried and the middle school girls laughed inappropriately so they wouldn’t cry and then cried anyways. The strangest thing was that Gus, the boyfriend in the movie, had John and Hank’s mannerisms. He had the eyebrow lift, the hand thing, the quick delivery of the witty line. Either he watched a million of their videos or they mimic the mannerisms of today’s awesome eighteen-year-olds. Either way, it’s weird to see a movie star doing someone you know’s mannerisms. Even if that person also happens to be a teen heartthrob of the internet age. Anyways, go see the movie. Read the book. Buy stock in Kleenex. Be good to the people you love before the inevitable oblivion. Let me tell you about my friend Hank. He is lanky and geeky and as smart as he looks and he dances a whole lot better than you’d guess, given his lankiness and his geekiness and his whiteness. In fact, he and his wife Katherine are just about the best dance-party dancers I know, even in full wedding regalia, and they can take down the house at karaoke, as they did one memorable night in the VFW bar in Missoula. That bar is a story in itself. But back to Hank: he’s the kind of friend who is easy to hang out with, even if months pass between interactions. Last week, I went to see him and his brother, John Green, the Best-Selling Young Adult Author, perform for 800 teenagers in a bookstore in the suburbs of Seattle. Ostensibly, it was a book reading for John’s new book, but it is the only book reading I have ever been to that involved any of the following: 800 teenagers, a sock-puppet, Hank appearing in drag as John’s wife, confetti, or songs about the mating habits of angler fish. This is because of the previously mentioned YouTube stardom, and how most authors whose book readings I attend are not teen idols. I should maybe mention I tend to attend poetry readings. 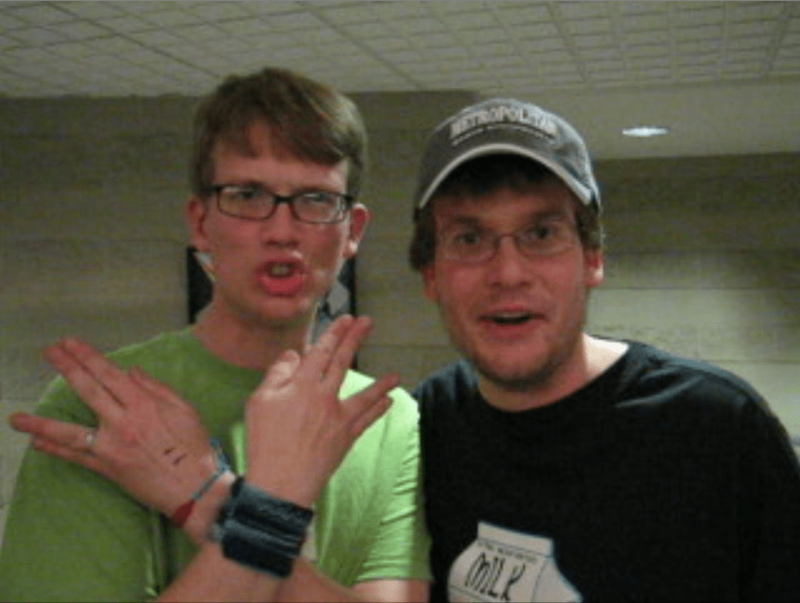 In any case, Hank and John are teen idols, and this was their second to last stop on a sixteen city tour, with a specially painted John Green Tour van and the whole shebang, including autograph-induced carpal-tunnel. I got there a couple of hours before the show so I could actually talk to Hank and Katherine, but already a line of teens stretched from the door around the edge of the strip-mall. They seemed so happy, messing around with their phones and talking to each other. Someone was playing the ukelale. Inside, an acned boy wearing a hat with tentacles on it (which turned out to be a head crab hat, whatever that signifies) was wandering around the bookstore with a video camera, talking to himself. I went backstage and drank bottled water with Katherine while Hank and John pre-signed about a trillion books. After a while, I ventured out to the bookstore bakery, the sister bakery to one I used to work at, to see if I was still sick of their devil’s food cupcakes. Two teenage girls were in line before me, and just when they got to the cash register, a scream went up from outside. “Have the menfolks arrived?” asked one of the girls, and the other ran out to check. The first girl dug frantically for her camera. “I know I have my camera on me somewhere!” she said, apologetically, as if the barista was in fact waiting for the camera to be produced, rather than the girl’s wallet. “Oooo, it’s Justin Beiber!” said one of the baristas, as the shrieking continued. “He’s way more important than Justin Beiber,” said the girl ahead of me. I happen to agree with her that what Hank and John are doing is significantly cooler than what Mr. Beiber does, however perhaps you and I can share the irony in it all that she missed. Looking around that room at those 800 over-documenting, pedestal-erecting, happy, nerdy teens, WHO WERE ALL BEING NICE TO EACH OTHER was pretty cool. They have built some strange community based on their love of Hank and John’s videos, songs, and books, and the videos other people make in dialogue, and probably some other things I don’t really understand because I live in a parallel universe where Hank is not someone you swoon-scream over. They have inside jokes and the whole deal. It is its own subculture, one based on being nerdy and tech-savvy and young and wishing Harry Potter books were innumerable, and it seems, on being generally nice to each other. “I like your hat!” yelled a girl in the row ahead of me, after we had all sat down. She had short hair and hip glasses and plenty of confidence. “Thanks!” said the boy with the tentacles on his head. “It’s a head crab!” “Cool!” she said, and it was, because they decided it was. Then Hank sang a song about particle physics, and the kids danced so hard the floor shook, and old lady me started planning which way I would run when the whole place caved in. Then I left, though there were hours worth of teenagers waiting for Hank and John to sign their bacon wallets, Head Crab hats, ukeleles, and of course, their books. I drove home with a strange feeling of limitlessness that comes from watching people’s dreams take on their own life, and also a lot of nerdy social-anthropology thoughts. The most interesting being this: it’s pretty cool that all these smart, different kids have this safe haven of the subculture they and John and Hank created. Watching them all interact made me happy for their generation. And yet, something about it is weird, besides that it is Hank on that stage. And it isn’t the tentacle hat, or the 800 teens at a book reading. It’s the “menfolks.” In my mind, that’s a word reserved for family, not someone whose books and videos you like. Maybe this was just the awkward word choice of a star-dazzled girl, but it seemed indicative of a sense of false intimacy. I know that people can give each other a lot through words. Hell, they can save your life, and help you remember who you are here to be. But that doesn’t make them family. It doesn’t even necessarily make them your friends. Especially if you squeal at them. I just hope that all those kids remember that, and ask more of their friends and families than they do from Hank and John.